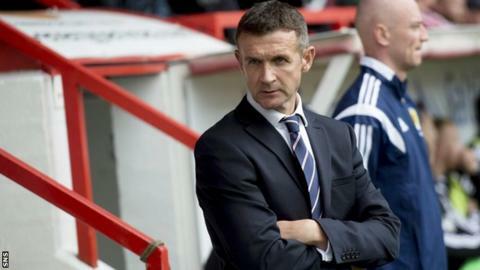 Ross County manager Jim McIntyre is confident he will turn things around despite the 5-0 drubbing by Celtic. County remain at the foot of the Premiership table after being taken apart by the champions on Saturday. But McIntyre, who was handed the reins in September, refused to read too much into the home defeat. "I knew the type of job I was taking on and I'm confident we will succeed in it - we've got good players who just under-performed today," said McIntyre. The Staggies simply could not contain a dominant Celtic side in the Highlands, with an Anthony Stokes double and goals from John Guidetti, Jason Denayer and Callum McGregor doing the damage. "We didn't start the game very well," added McIntyre. "Obviously Celtic played very well but the goals we gave away just don't give us a platform to get into the game. Two set plays are really poor from our point of view and we've dropped the runner twice as well. "It was a tough day and one the players will learn from. "We've been working far more on possession of the ball and trying to be braver on the ball, and that's something we never did today, which was disappointing." County went into Saturday's game having picked up four points from their previous two league games, their only points of the campaign. And despite the nature of the defeat against Celtic, McIntyre does not expect his players to suffer a hangover when they visit St Mirren next week. "Morale will be fine," said the former Queen of the South boss. "They will be hurting right now, of course they will, and we will watch it back and learn from it. "In the longer term, the picture doesn't change for us, we know what we need to do and we need to do it a lot better than we did today." Prior to the match, Ross County signed free agent Paul Quinn, the former Motherwell and Cardiff City defender who had been on trial at Victoria Park.